Richmond, British Columbia – see directions and map below. 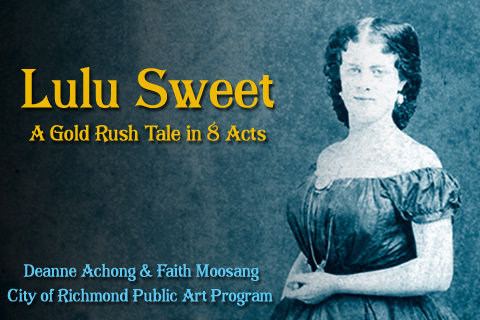 Lulu Sweet – A Gold Rush Tale in 8 Acts (2014), is a location aware walking tour app situated on the Fraser River, re-imagining the life of Gold Rush actress Lulu Sweet, for whom Lulu Island (Richmond, BC) was ostensibly named. 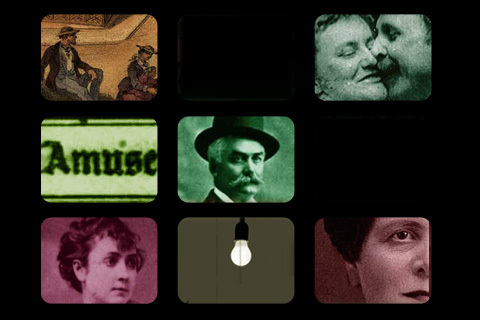 Using animations, archival imagery and sound, panoramas, and 19thC newspapers, the artists take viewers on a journey from New York in 1850 through Panama (pre-canal), to the mining towns of California and the outposts of colonial England, ending in the footlights of the Gold Rush stages of San Francisco. There are nine gps activated hot-spots, each taking you back to a different moment in time, from 1850 to 1863. Lulu takes the stage at the tender age of ten in Hildreth’s Diggings, California; shares the stage with the notorious Adah Menken in San Francisco; is managed by desperate swindlers and hot-headed gamblers. All of this set against the backdrop of the Fraser River itself, upon which she and Colonel Moody sailed in 1861, the supposed moment when the island received its name. Meet by the statues in the North East corner of the Olympic Grounds on the Dyke Trail. Paid parking available at the Richmond Olympic Oval. There will be a sandwich board and table with some balloons to help you find us. Artists will be in attendance on Saturday, September 21st from 11am to 4pm. Congratulations! So excited to see this project coming to fruition.